Visual comparison of recent result images. Bigger cards on iPhone 6. Graphical enhancements, bug fixing, new experienced data, some new photos. This first version was written in Pascal. Strange, but this program is here still downloadable. - Comparison of your score with the result of a "non-strategy" (i.e. analysis you can write them out to a text file. 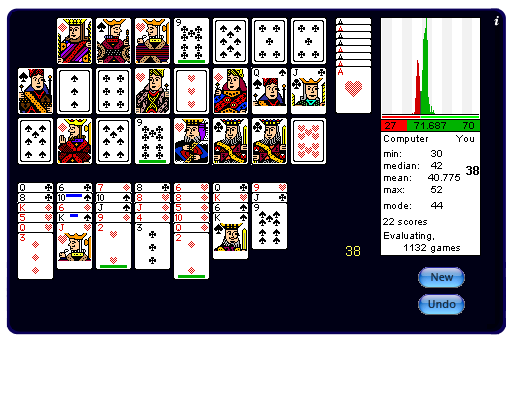 different movable cards (or in many situations, to wait with some moves). of looking for movable cards. balloon help, preference file etc. Gallery is free (but my children like postcards). Enjoy! The Dashboard Widget (Mac OS X) is based on the Java applet implementation. With the decreasing support of Java for applets I had to stop the support for the Java applet version. With a little bit of luck you can start it here.